WARNING: Individuals using prescribed medications such as antidepressants, including Serotonin Re-Uptake Inhibitors and MAO Inhibitors should consult a physician before using. 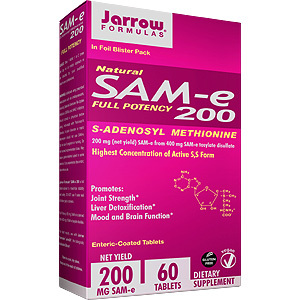 Individuals with Parkinsons disease, bi-polar disorder or manic depression should not use SAM-e.
Other ingredients: Microcrystalline cellulose, mannitol, enteric coating (methacrylate copolymers), glycerol behenate, talc, triethylcitrate, glycerol palmitostearate, medium chain triglycerides, silicon dioxide, magnesium stearate, titanium dioxide, sodium starch glycolate and riboflavin. Suitable for vegetarians. 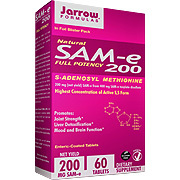 This product complies with the proposed USP Monograph for SAM-e. I have been using this for over 6 years and it is a perfect product to use as an anti depressent. It has really worked great and I feel so great. I don't know where I was without this. I have gone through a great relieve of joint pain. It has also really boosted my mood and I feel amazing once I wake up. SAMe 200 is shipped in a discrete, unmarked package. Orders are processed immediately and usually take about 3 to 5 working days to be received. We do ask that you try it for 2 to 3 weeks to feel the full effects. Any information received is used only for order processing and shipping purposes. Your information, such as e-mail address, will never be disclosed to a third party.